Whose mischief created a world of beseechers? This line from the famous Mughul poet Ghalib refers to what he claimed to be ancient Persian tradition of petitioners wearing paper before entering the courts to get justice. Indeed, for a country that has a low literacy rate, the written word is a central part of Pakistani society. 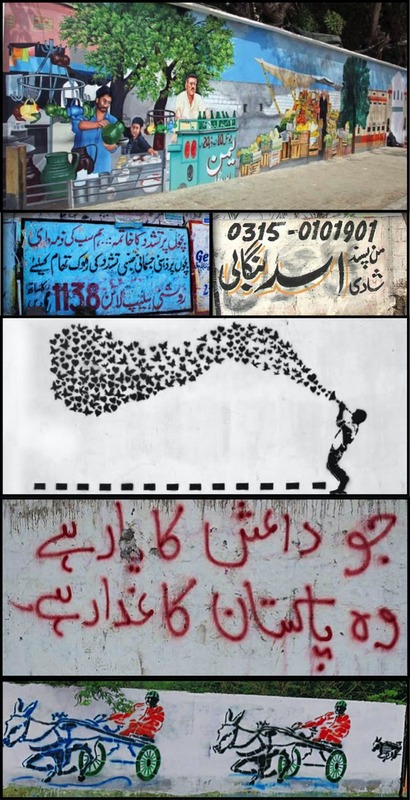 All over Karachi, "wall chalking", as it is called, lines the streets with announcements of political meetings, informal advertising and messages in support of or against political leaders. Intelligence agencies and the press pick up writings that appear overnight as a show of political strength or indicators of political party infighting. Sometimes walls carry threats against specific people, such as "ainda na dehkoon" (this should not happen again) written by "bosses" to keep the local heavies in check. These are usually written in Urdu calligraphic style. An unusual message stands out for its untidy spray painted phrase "Perfume Chowk" (perfume crossroads). Curious viewers discovered it was a message written by the heroic owner of a small stall selling attar (scented oil) in Gulistan-e-Jauhar, a suburb of Karachi, whose stall was regularly destroyed by people to whom he refused to give protection money. Countries have many narratives: the official state narrative, the narratives of friends and allies, that of enemies, of moral custodians; and then there is the complex, layered narrative of a country's people. These occupy sociologists, historians, literary critics, artists, film-makers, musicians, novelists and poets. Beneath the surface waves, one has to dive deeper to understand the true nature of the soul of a people, but occasionally the hidden becomes visible and lends itself to decoding. This is most true of the place occupied by poetry in Pakistan. Classic forms can be of religious songs such as naats (a poem usually sung without music in praise of the Prophet Muhammad), qawalis (Sufi devotional songs performed by a large group of musicians accompanied by harmonium, drums and rhythmic clapping) and marsias (a poem of mourning and lament recounting the martyrdom of the Prophet's grandson and his family at Kerbela). A song of joyous love and surrender, from the poet Amir Khusro to his spiritual guide, Nizamuddin Auliya by qawwals Farid Ayaz and Abu Mohammed. But often poems are also more worldly love songs of film; colourful metaphors that take place during mushairas (public recitation of Urdu poetry) or poetry events. The preferred form of Urdu poetry is the ghazal, or couplet, which has its origins in Arabic literature via Persian poetry. Ghazals are composed as sophisticated conceits, ostensibly about love, longing, separation and loss, but imply commentaries that range from Sufi love of the divine, to local politics. The decorated transport of Pakistan is much celebrated for its excessive colourful adornment and painted images. Less noticed are the embedded verses that are an essential part of all trucks, buses and rickshaws. These are attempted conversations with "someone out there", an amplification of one's presence in a society that renders the common man invisible. "Whispering in our ears", these writings express personal feelings, outrage or simply indignation, loss, desire, or a moment of reflection. Hungarian philosopher Ferenc Hörcher has suggested that conversation "liberates the human self from the bondages of practical life and brings about a sense of equilibrium". Intimate expressions are externalised in the public sphere addressing an assumed community. These writings symbolise an attempt to wrest authorship by marginalised citizens. There are 600,000 commercial vehicles, which include buses, trucks and three wheelers (among them rickshaws), that circulate on 260,760 km of roads according to 2010 data published by the government. Most of these vehicles carry writings. From left to right: A Pakistan Youth Alliance rickshaw carries peace messages; Discreet writing on a police vehicle reads: 'All your splendour will lie useless, when the nomad packs up and leaves'; a Melbourne tram decorated like a Karachi bus. Pakistan is portrayed as a belligerent, angry country, churning out extremists. The poetry on decorated transport tells another story. The most commonly used phrase is Maan ki dua Jannat ki hawa (A mother's prayer is a breeze from heaven) followed by Dekh magar piyar say (You can look, but with love), and a newcomer, Jiyo aur jinay do (Live and let live). Left to right: A truck reads, 'Oh Bulbul, why do you cry? Are there no fruits in your garden? I should cry whose life knows no peace'; the back of a truck simply says 'Love'; a passenger bus decorated with reflective tape. Buses and trucks are usually a lucrative business. The rickshaw on the other hand is usually owner-driven and provides an insight into Pakistani society's least privileged communities. Rather than the ghazal couplet seen on trucks and buses, rickshaws have boldly written enigmatic poetic phrases such as Kaash (if only), Bikhray Moti (strewn pearls) zakhmi parinda (wounded bird) akhri goli (the last bullet). Sometimes a rickshaw simply carries the name of a beloved daughter or a Sufi saint. Funny poems or phrases are common to all forms of transport, making life's problems and suffering bearable if only for a while. This is a feint that compels us to read between the lines, an essential component of the layered and often esoteric nature of Pakistani society. Arabic poetry also gave Urdu the influence of Hija or satiric poetry. While the -qit'ah (a light-hearted fragmentary poetic phrase) extolled the virtues of tribal heroes, the hija denigrated rival tribes. Another influence is that of Sufi poetry. The majority of Pakistani Muslims are of the Barelvi sect, which is interwoven with Sufism. Most decorated vehicles carry messages and prayers collected from Sufi shrines. This penchant for bitter-sweet or dark humour pervades Pakistani society and may spring from the loss of agency in a region that has been repeatedly invaded since at least 1800 BC, each invader creating a powerful ruling elite imposing its culture and ignoring, for the most part, the lives of ordinary citizens.